In October, the U.S. Department of Transportation (“DOT”) released a summary report detailing the results of a study aimed at enhancing bicycle and pedestrian safety nationwide. Assessments conducted at 52 locations across the country sought to identify common safety challenges and help the diverse jurisdictions work together to provide solutions. The majority of the issues identified by the study fell into two categories: physical barriers and institutional issues. This report is one step in a coordinated effort to address these safety challenges. Within the category of physical barriers, the assessment identified several types of challenges. Roadway design issues tended to reveal a preference for speeding along drivers rather than facilitating walking or cycling. Specific design issues included: A lack of curb cuts; Large, multi-lane roads without safe passage for non-motorists; and Gaps in bicycle and pedestrian routes. The study also expressed concerns about ensuring access for disabled individuals and ensuring pedestrian and bicycle routes link up to public transit. Although this specific report focused on identifying issues rather than solutions, the DOT emphasized the importance of improving both facilities and signage. The study also looked at institutional barriers, including the failure of transportation planning processes to adequately account for the needs of pedestrians and cyclists. In some cases, these interests were only considered late in the process and became almost an afterthought added on after decisions had been made. The DOT notes that a “complete streets” policy that integrates all transportation methods into the planning and design process is one way to address this problem. Other institutional barriers discussed in the report include: Limited public engagement; Difficulty keeping up with changing communities; Funding problems; and a Lack of intergovernmental coordination. Additionally, the study noted the importance of educating the public and enforcing safety rules. We applaud the efforts of groups like Albany Strollers & Rollers as well as the Department of Transportation and all those who participated in the recent study. 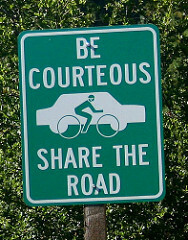 Bicycle safety and pedestrian safety must be part of our concept of public safety. We are proud to support the San Francisco and Marin County Bicycle Coalitions as they work to keep our region safe. If a serious bicycle accident injured you or someone you love, we can help you pursue your legal rights and fight for just compensation. Contact our bicycle accident law firm in Santa Rosa, San Francisco, or Oakland to schedule a consultation with our experienced Northern California bicycle accident attorney. There is no fee unless you recover money.